Patty and her husband, Dan, were getting divorced. While he was shacking up with his dental assistant, I was living non-conjugally with his wife and three kids after I had, for the nth time, denounced New York City. The greater Dallas area was my new home, I told myself, and I embraced it with all the excitement and innocence of Kennedy in 1963. I chose Dallas because Patty and her two friends, Laverne and Maxine (clearly, not their real names), were planning to open a spiritual center and wanted me to join as advisor. (This was during the time known as the Great Shirley MacLaine Epoch, so forgive any star-blinded lapse in judgment.) I was no more qualified to rope and brand a Texas longhorn that I was to advise these under-sexed, overpaid housewives. But we had met at a conference for the great spiritually unwashed and took a shine to each other. Plus, I’d sublet my apartment for three months as a first step in escaping my strangled existence in NYC. When Dan, who was looking for any reason to unseat Patty from the house he financed, discovered a “light-in-the-loafers city slicker” mixing with his impressionable children, I was on the porch within an hour. No home. Few prospects. Little money. Of the three Lone Star Andrews Sisters, Laverne was the most compassionate. “Let’s move you in with CarolJean,” she said, patting the seat of her pickup as I tossed my bags into the back. CarolJean was her 21-year-old daughter trying the living-on-my-own gig, and none too successfully. She was a retired high school baton twirling champion, who, after the glittery sequins unraveled from the costumes that I later discovered she still wore around the house, gave up and took to life on the couch. When we entered her apartment, she was, as predicted, prone on the sofa–in each fist a baton twirling like a propeller. The slam of the door startled her and, misjudging the height of the ceiling, she scuffed it. Apparently, she must have suffered from significant depth-perception problems: the ceiling everywhere was punctuated with a riot of eraser-gray commas. “Well, I have to get buffed and fluffed!” Laverne said loudly for CarolJean’s benefit, then she gathered me close. “Bless you, David,” she whispered. “Bless you.” I was left with the eerie feeling that it wasn’t me who was on the receiving end of the goodwill baton. With that, she retired to her room, only the occasional thunk of rubber hitting plaster to be heard late into the night. Life careened downhill after that. Within a week all of CarolJean’s rented living room furniture was repossessed. A month later, so was her BMW, a belated gift to herself for her crowning twirling achievements. After a few more weeks, I’d grown desperate. Patty, Laverne, and Maxine moved on for good. Their token visits petered out (phone calls were out of the question because the line was turned off). They had turned their attention from the spiritual center to an aerobics studio–wedding planning venture. “Drop one sack of lard and pick up another–all in one place!” Patty liked to say. I meted out my money, trying to budget until I was able to return and reclaim my so-called life. With no car to borrow, I was forced to walk three miles to and from the supermarket once a week to shop for food. One Friday, so depressed by my reduced means, I copped out and walked to the nearest convenience store. And it was there, in front of the frozen foods, with a month left before I flew home, that I had my version of the Epiphany. The very same corn dogs that I’d enjoyed with abandon with the kids at Patty’s house were on sale. And not just on sale–but deeply discounted. Woozy from lack of sustenance, I calculated that if I bought several boxes, and limited myself to three dogs a day (four on Saturdays and Sundays), I could make it through. Back home, I ripped into a package and slid two dogs (an extra ration, I know, but it was worth it) onto a plate and into the microwave. I knew they wouldn’t have the just-fried crunch of the ones Patty made in the oven for the kids and me, but no matter. As I bit through my joy on a stick, I silently thanked all the pork and beef by-products that went into the making of my meal. The cornmeal coating, which I nibbled off a bit at a time to enjoy the different flavors and textures (yes, a corn dog can have different flavors and textures), was pleasantly mealy and had that slightly chemical sweet taste of Bisquick pancakes that were slathered with butter but bereft of syrup. The hot dog itself was juicy and, well, meaty enough to balance its cornmeal shroud. When I was done, I washed the plate (the water hadn’t been turned off yet) and returned it to the cupboard. Sated, I curled up under a blanket in what I deemed my bed and fell contentedly to sleep. Over time I took to thinking of corn dogs as my own personal savior, which I know can–at first blush–appear blasphemous. But I meant it with all the reverence and fervor of a tent revival convert. It’s not that I was seeing the face of Jesus fried into the cornmeal coating. Rather, ever since that moment of awakening in front of the frozen food case at the convenience store, I knew I’d be okay. I knew that I’d make it through the long, dark days before returning home. The bottom line is, something or someone caused to me to zig to that convenience store rather than zag to the local Tom Thumb, where prices were significantly higher and I didn’t have a shopper’s card. And that someone was my own personal savior–on a stick or not. 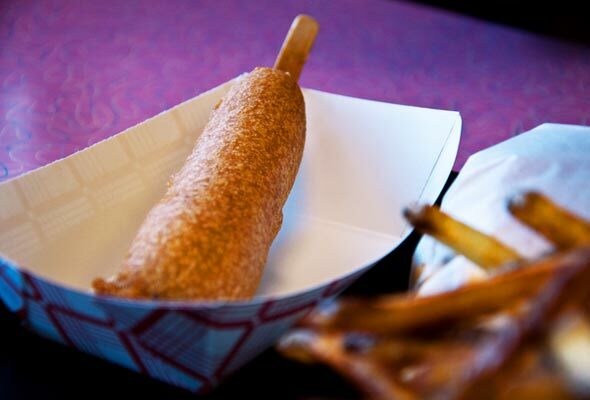 Clearly the corn dog is all—or very nearly all—about the dog’s crunchy, corny coating. But Beth Price, our Director of Recipe Testing, recently drew our attention to how not all corn dogs are created equal, though not for the reasons you may think. She finds the most compelling part of a corn dog to be the crunchy little blob of fried batter at the base of the hot dog. You know, that part that seemingly secures the corn dog to its prehistoric yet practical eating utensil, the stick. 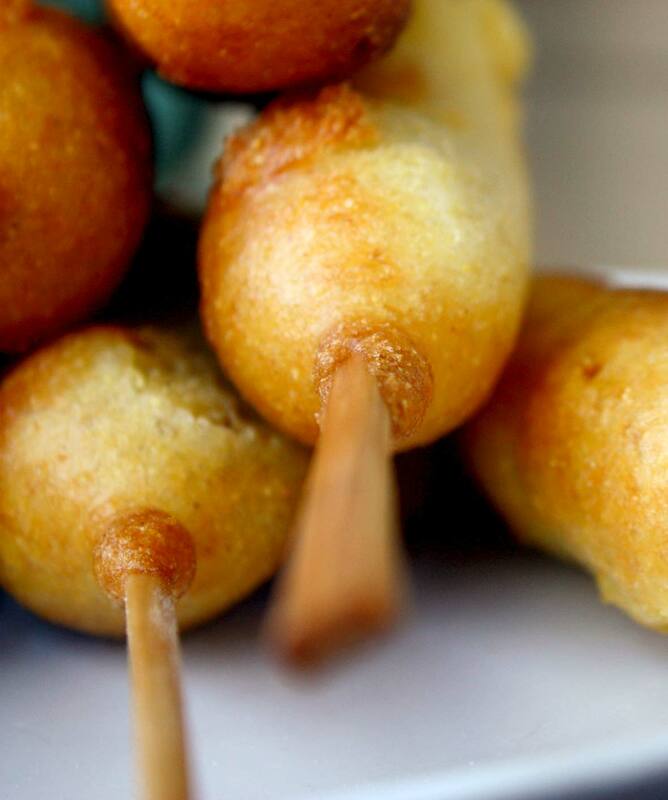 That little blob exists only when the dog is fried on the wooden skewer, whereas this recipe inserts the skewer into the corn dog after frying, for what we think are fairly obvious safety reasons. Still, even minus the coveted blob, Beth and her sons swooned to this recipe. For Beth’s fellow blob devotees—or those of you who are just curious or drawn to danger, here’s the scoop on how to make those little love handles. 1. In a large bowl, combine the flour, cornmeal, sugar (if using honey, don’t add it quite yet), baking powder, and salt. 2. In a smaller bowl, whisk together the egg and 1 cup of the milk or buttermilk. If using honey, add it now. 3. Whisk the wet ingredients into the dry ingredients, mixing just until combined. The batter will be quite thick. 4. Heat a couple of inches of oil in a deep pot or ample oil in a deep fryer to 360° to 365° F (182° to 185°C). Scatter some flour on a plate. Using tongs or your fingertips, roll a hot dog in the flour to coat. This will help the batter cling to the hot dog. Then dip the hot dog in the batter and coat it evenly. If you find that the batter is way too thick, add up to 1/4 cup more milk or buttermilk, stirring in just a little at a time. Add the corn dog to the hot oil and quickly repeat, frying only a few corn dogs at a time and being careful not to crowd them. Cook, turning as needed, until the batter is golden brown and the dog is warmed through, 2 to 3 minutes. Transfer to a plate lined with paper towels or a brown paper bag to drain for a minute or two. Skim any bits of batter from the oil, return the oil to its proper temperature, and repeat with the remaining hot dogs and batter. 5. Insert a wooden skewer in the end of each corn dog and serve immediately, with mustard if desired. And napkins. Lots of napkins. Corn Dogs Recipe © 2010 David Leite. Photo © ehfisher and Erin Pawlicki. All rights reserved. All recipes and photos used with permission of the publisher.